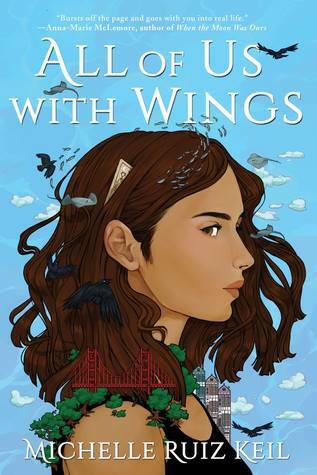 All of Us With Wings, Michelle Ruiz Keil’s mythology-inspired #OwnVoices debut is a post-punk San Francisco fairy tale about a seventeen-year-old Latinx governess, her tween genius change, the girl’s rock star family, and a pair of ancient children bound to right the wrongs of her stolen childhood. Seventeen-year-old Xochi loves her job as live-in governess for tween genius Pallas, enchanted by the girl’s pagan rock star parents and the storybook Victorian mansion they share with their band, Lady Frieda. Determined to deserve the fairy tale life she’s fallen into, Xochi does her best to put Pallas’s needs before her own–ignoring the grief that lingers from her grandmother’s death and rejecting her growing attraction to Pallas’s guitar player dad, who shares her half Mexican heritage and troubled past. Then, on the night of the Vernal Equinox with a party raging in the house below, Xochi and Pallas perform a riot-grrrl ritual that unintentionally summons the Waterbabies.